Sometimes "Pretty in Pink" is not a good thing, especially when it comes to our skin. Excess pink or redness means it is being stressed or something is irritating it. Sensitive or Allergic? How can we tell which is which? Sensitive skin that flares up when the skin is rubbed, scratched or stimulated and gets flushed or pink means that it is probably sensitive to those situations and especially climate changes. When using cosmetics, it can get flushed but if the products are beneficial, eventually the flushing will subside. Prickling or the feeling of tiny ants running all over your skin means collagen and cell turnover are being enhanced. An allergy is when the skin comes into contact with a particular ingredient or product and flares up, hives are formed and the skin can feel like it is burning. Once the ingredient or product is removed, the symptoms go away. It is important to know the difference because many of us feel we are sensitive from past experiences with harmful or irritating cosmetics that at one time made us react. That usually means that they were not good for the skin because the skin could not work with them and was suffering. Osmosis Skincare products offer formulas that your skin cannot only recognize but really work with the skin to correct sensitivity. However, we do have several products that are stimulating but they are offered in various levels of activity to allow most skin types and conditions time to heal and adapt. Our skin has its own personality and functions very similar to our body. Give it ingredients or products that it does not find comfortable and it will react. Just like we become uncomfortable when we eat something that doesn't agree with us. 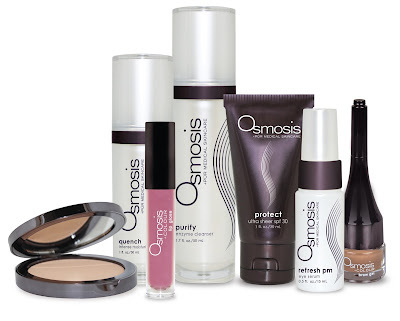 Once your skin is using Osmosis products, it is like comfort food. It begins to relax and feel content. Once the skin is no longer stressed from irritating products, the "Pink" color subsides. So give the "Pink Slip" to those cosmetic products from the past and find comfort and performance in Osmosis Skincare.